Celebrating the future sound of yesterday and 21 years of Cookin’ On 3 Burners, Jake, Dan and Ivan are excited to announce they’ll be dropping their next installment of organ laden funk jams on Lab Experiments Vol. 2, the sequel release to 2017’s Lab Experiments Vol. 1: Mixin’ on Friday 26 October. With collaborations galore, the album includes the recent dance floor filler ‘Warning’ featuring rising neo-soul singer Kaiit, as well as other hot collabs with The Meltdown’s resident heartbreaker and vocalist Simon Burke, soul queen Kylie Auldist and Chicago born, Melbourne-based Fallon Williams who lends his gritty vocals to the outfit’s single ‘Force of Nature’. Self-produced and boasting eight of the Burners’ signature deep funk and organ jazz infused tunes, you won’t be disappointed as they take you on yet another musical journey of soul, up-tempo boogaloo, cinematic journeys and straight up dirty dance floor funk with Lab Experiments Vol. 2. Growing ever richer, like an aged fine wine, the Melbourne-based act seem to forever be at the top of their game, boasting a live show that is a true gift to behold. 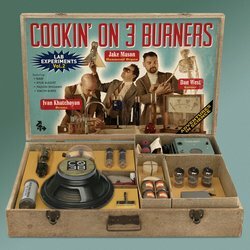 If you haven’t heard or seen Cookin’ on 3 Burners yet, you’re in for a treat.